Evil did not come into the world with the first murderer. Evil did not come into the world the first time the people killed a murderer in retribution. Evil came into the world the first time the people knowingly killed an innocent person because that person was a member of the same race, religion or tribe as a murderer. Maybe these unwanted presidential dollar coins could be used to buy back some of the outstanding U.S. Treasury bonds and reduce the national debt. Did a crossword predict the 1996 election? On November 4, 1996, the day before the 1996 Presidential election, the New York Times ran a crossword puzzle that apparently predicted the outcome. Click on NY Times Crossword Puzzle 1996 Election to see how they did it. Michael Cembalest, chief investment officer for J.P. Morgan Chase, says corporate profits are high largely because the wages of American workers are at a 50-year low relative to the size of the U.S. economy and to corporate sales. From his point of view, corporate profits are what matters, but he thinks they rest on a shaky economy. Hence the title of his report: Twilight of the Gods. Here’s a summary of his report by Harold Meyerson in The Washington Post. The primary subject of Cembalest’s report isn’t wages. It’s profits — specifically, the fact that profit margins (the share of a company’s revenue that goes to profits) of the Standard & Poor’s 500 companies are at their highest levels since the mid-1960s, despite the burdens of health-care costs, environmental compliance and other regulations that are presumably weighing down these large companies. “There are a lot of moving parts in the margin equation,” Cembalest writes, but “reductions in wages and benefits explain the majority of the net improvement in margins.” This decline in wages and benefits, Cembalest calculates, is responsible for about 75 percent of the increase in our major corporations’ profit margins. Or, to state this more simply, profits are up because wages are down. That’s not the only reason profits are up — innovation and offshoring factor in as well — but among the reasons, it’s a doozy. PFC Bradley Manning has been imprisoned for 14 months on charges of leaking secret government information, including the tape for the Collateral Murder video, to Wikileaks. He was held at Quantico Marine barracks from July 2010 to April of this year under conditions of solitary confinement and maximum security that resemble Soviet-style brainwashing. He is now being held at Fort Leavenworth, Kansas. No trial date has been set. Specialist Ethan McCord, who served Bravo Company 2-16, the ground troops depicted in the video, told blogger Glenn Greenwald that if Manning was the leaker, he is “a hero of mine.” Here is his statement. We weren’t trained extensively to recognize an unlawful order, or how to report one. But many of us could not believe what we had just been told to do. Those of us who knew it was morally wrong struggled to figure out a way to avoid shooting innocent civilians, while also dodging repercussions from the non-commissioned officers who enforced the policy. In such situations, we determined to fire our weapons, but into rooftops or abandoned vehicles, giving the impression that we were following procedure. On April 5, 2010 American citizens and people around the world got a taste of the fruits of this standing operating procedure when WikiLeaks released the now-famous Collateral Murder video. This video showed the horrific and wholly unnecessary killing of unarmed Iraqi civilians and Reuters journalists. I was part of the unit that was responsible for this atrocity. In the video, I can be seen attempting to carry wounded children to safety in the aftermath. The video released by WikiLeaks belongs in the public record. Covering up this incident is a matter deserving of criminal inquiry. Whoever revealed it is an American hero in my book. Private First Class Bradley Manning has been confined for over a year on the government’s accusation that he released this video and volumes of other classified documents to WikiLeaks — an organization that has been selectively publishing portions of this information in collaboration with other news outlets. Hat tip to The Dish for the link. 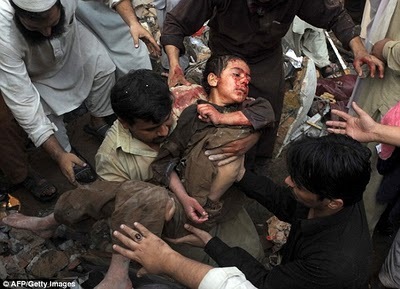 CORRECTION: IN THE ORIGINAL POST, I RAN THIS AS AN EXAMPLE OF NOOR BEHRAN’S PHOTOS OF VICTIMS OF DRONE ATTACKS. BUT I HAVE BEEN PROVIDED WITH A LINK SHOWING IT RAN IN THE DAILY MAIL OF LONDON ILLUSTRATING AN ARTICLE ABOUT A TALIBAN CAR BOMB ATTACK IN PESHAWAR IN PAKISTAN. SEE THE COMMENT SECTION. I cannot understand why a public official would make a claim that is so obviously impossible, and so easy to disprove. Assume that the CIA never makes a mistake in identifying an intended target. Assume that the flying killer robots go exactly where intended. How is it possible to set off high explosives in crowded villages, and not take the lives of bystanders? An intrepid Pakistani photographer named Noor Behram has been going into Waziristan for three years, photographing the places where the drones hit. He has well documented that civilian bystanders are indeed dying in the drone attacks. Here are highlights of The Guardian’s report on his work. But my real non-rhetorical question is, what system of political economy isn’t unworkable then? Outright communism breeds tyranny, nomenklatura and misallocation [of resources]. Attempted laissez-faire degrades to an archipelago of private tyrannies. The institutions of neoliberal monetarism (central banks; national treasuries), the governing ideology of the US and Europe since the 1980s, get captured by the asset-holding classes, which is why we’re skating the edge of a deflationary sink. That leaves . . . what exactly? The history of the 20th century shows that centrally planned economies don’t work. Knowledge is too widely distributed in society for a tiny group of masterminds to be able to direct the economic activities of everybody else. But unfettered capitalism isn’t working either. Power has migrated into the hands of financiers and corporate executives who are rewarded for exploiting their positions, not for creating value. Here in the United States, working people have experienced 25 or 30 years of slow decline and we are now mired in a “jobless recovery” (also known as a depression) with no end in sight. Limited-liability corporations are replaced by cooperatives. You’re not hired by a co-op; you join it. 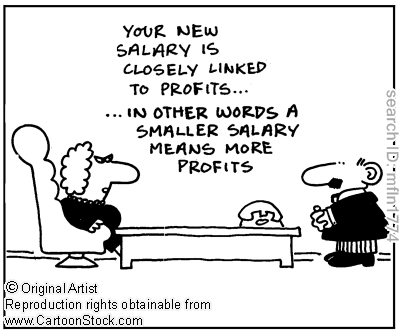 The purpose of the co-op is not to maximize profits; it is to maximize wages and benefits. Investment banks are replaced by non-profit grant-making “banks.” They allocate capital to the cooperatives based on their judgment as to whether the cooperative will create jobs, and are given more capital depending on their success in creating jobs. Free markets and economic competition, however, still determine which cooperatives thrive and grow and which ones fail. Government does not own industry nor micro-manage individual enterprises. There is no central planning board. The cooperative can do anything (within the law) that its members and directors think will be beneficial. Not everybody in the co-op will have equal shares or equal wages; that’s up to the members. Not every co-op will be a success; that’s up to the workings of the market. The difference betwee a co-op and a corporation is in the organization’s purpose. The objective of a corporation is to maximize the return on capital. The purpose of a co-op is to maximize the return on labor. 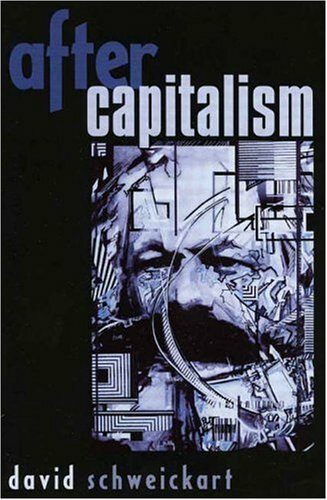 Capital for a cooperative would come not from stock or bonds, but from grant-making “banks.” Instead of paying interest on loans and dividends on stock, a cooperative would pay a flat tax on its capital (calculated, I suppose, in the same way as the book value of a corporation). The cooperative would have a legal obligation to maintain the value of its capital, through a depreciation fund, and to pay minimum wage. If these requirements could not be fulfilled, the cooperative would be required to disband. Revenue from the tax on capital would go into a new public capital fund, which would be allocated to local areas based on population, and then among local grant-making banks based on their past success in generating jobs. Schweikart’s model is the successful Mondragon Corporation, a cooperative organized by a Catholic priest, Don Jose Maria Arizmendiarrieta in the Basque region of Spain in 1956, to create jobs for graduates of the vocational school he founded. It started by making small cookers and stoves, and now is a multinational conglomerate with 84,000 employees and 256 affiliated cooperatives, which did about $19.5 billion worth of business last year. That’s up from 53,000 employees and $6.6 billion revenue when Schweikart wrote his book. The first example of superior principle is inferior to the developed example of inferior principle. President Obama is using the debt ceiling talks as an excuse to reduce Social Security benefits—even though Social Security adds not one cent to the national government’s debt. The method by which this would be accomplished would be to index Social Security benefits to something called the “chained Consumer Price Index” which would go up at a slower rate than the regular Consumer Price Index. This could lower the annual income of the average retiree by small amounts year by year, but the cumulative amount would be large—nearly $1,000 a year by age 85, nearly $1,400 a year by age 95. The idea of the chained CPI is that people adapt to higher prices by changing their habits, and so their actual cost of living does not go up at as fast a rate as actual prices. This is different from the “substitution effect,” which is incorporated into the regular CPI—that if the price of beef goes up, but the price of chicken does not, then people will switch to chicken and this affects their cost of food. (This illustrates the principle. I don’t know if it is an actual example. )(This is an actual example) The chained CPI takes into account not only substitutions of products, but changes in lifestyle. If you take a “staycation” instead of a regular vacation, your cost of living doesn’t rise with the cost of travel. (I’m not sure if this is an actual example). The problem with this is that the budgets of elderly people are not so flexible. Even the regular CPI does not reflect the cost of living of the elderly. A couple of years back, the Bureau of Labor Statistics created a new index called the “Consumer Price Index–Elderly” or CPI-E, which reflected out-of-pocket expenses for medical care, drugs, special diets and other costs specific to the elderly. What the bureau found was that the CPI-E index rose twice as fast as the regular CPI. So Social Security increases already fall short of the actual cost of living of the elderly, and the Chained CPI would cause them to fall behind even more. Cutting Social Security benefits would not reduce the national debt one cent. Social Security has its own revenue stream, and the Social Security Administration is currently drawing down a surplus accumulated in prior years to meet its current payments. By most estimates, the Social Security Administration will be able to meet its obligations with no change in benefits or taxes for at least 25 years. 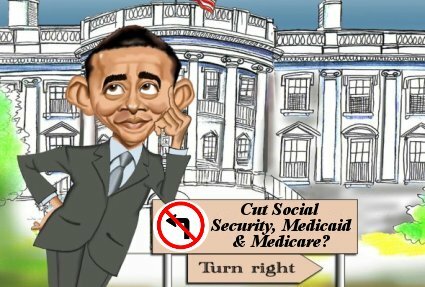 If Social Security benefits are cut and Social Security taxes remain the same, the Social Security Trust Fund will continue to buy U.S. Treasury bonds, and these bonds will still be a fiduciary obligation of the government, whatever retirees get or don’t get. Remember the distinction between marginal income taxes and the effective tax rate. 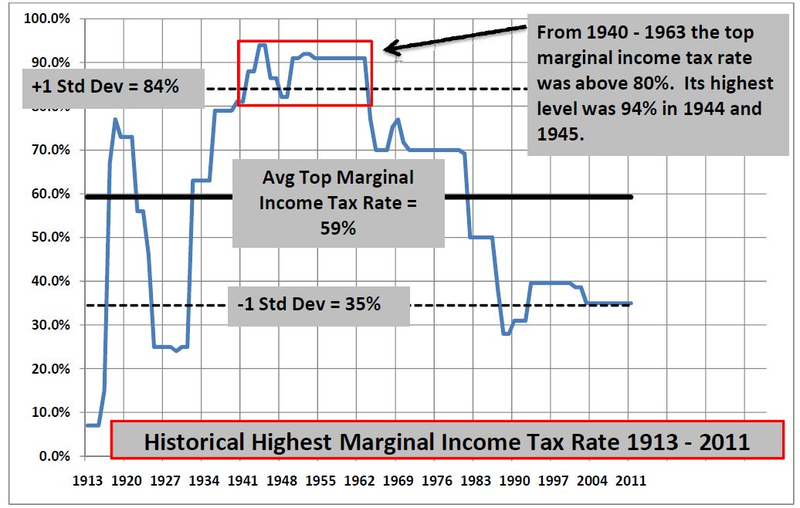 The marginal income tax rate is the tax on income above a certain high threshold. Nobody pays 35 percent of their total income in federal income taxes. U.S. taxes on corporations, investments and estates also are low, by historic standards and in comparison with other countries, as the charts below show. The International Monetary Fund has offered loans to the new governments of Egypt and Tunisia—a truly bad idea of which these countries’ leaders are rightly wary. Now, before Tunisia and Egypt even have new governments in place, the IMF has jumped to offer them loans for vast infrastructure projects in the desert—as if the fund didn’t know that young Arabs there want ways to start businesses and have careers, not temporary construction jobs. The Greek debacle and the North African drama raise existential questions about the IMF. Responsible governments have no business borrowing vast sums from abroad, rather than from domestic sources. That’s what tinpot regimes do. And lending even more to borrowers who can’t pay what they already owe? That’s what loan sharks and mafiosi do. It isn’t hard to imagine the consequences of massive loans 10 or 20 years from now—the Egyptian and Tunisian government unable to pay back the loans, and being forced to cut back public services and sell off national assets as part of an enforced “austerity” program. I think that this is misguided generosity. A cynical view would be that this is just what the IMF administrators intend. Click on What’s Wrong With the IMF for the full article by Amar Bhide and Edmund Phelps in Newsweek. (Hat tip to National Review Online). Click on Kudos to Egypt for Ditching the IMF for analysis by Mark Engler in Dissent magazine. Party responsibility should be moved a year to the right. Fiscal 2009, which began Oct. 1, 2008, was the last budget of the George W. Bush administration; fiscal 2001, which began Oct. 1, 2000, was the last budget of the Clinton administration; and so on. Nearly every chart showing the history of federal taxes and spending makes this mistake. Nevertheless, the chart is important because it shows that the size of the total government debt, not the size of the annual deficit, is what matters. The government’s annual deficit was slightly lower in 2010 than in 2009. How much that was due to President Obama and how much to the economy, I can’t say. Nevertheless, the total government debt went up, as under previous administrations. There’s something else that’s even more important than the size of the government debt, and that is the size of the debt in relation to the size of the economy. The United States came out of World War Two with a huge debt that never was paid off, but it ceased to matter, because the economy grew so much in the next 30 years that the debt become less and less important. The debt to GDP ratio can be improved by reducing or eliminating the annual government budget deficit, and by growing the economy. Economic growth will help shrink the deficit. Shrinking the deficit may or may not help economic growth, depending on how it is done. The federal government does not control the growth of the economy, but there are ways that it can help. It can rein in reckless speculation by investment banks, so that they return to investing in the real economy. And it can spend money on things that contribute to economic growth, such as education, scientific research, infrastructure and maintenance of basic services. There is a fine line to walk. Spend money on useless things, and you worsen both the government’s financial position and the overall economy. Refuse to spend money on essential things, and you also stifle economic growth. 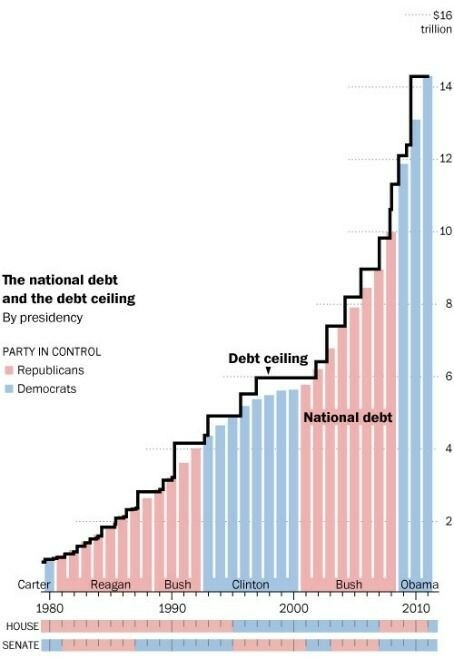 The federal debt ceiling has long been a political football. The political party in power favors increasing the debt ceiling, many members of the party out of power oppose increasing the debt ceiling, but, until now, the debt ceiling always has been raised. Democrats are running the following broadcast by Ronald Reagan in 1987, appealing for an increase in the federal debt ceiling. Republicans might well run a clip of Senator Barack Obama, opposing an increase in the debt ceiling under President George W. Bush. Click on Then and Now: The changing rhetoric in the debt-limit debate for a review of changing positions on the debt ceiling by prominent political figures. Click on Democrats invoke Reagan in support of debt-ceiling increase for a comment on the Democratic stance on the debt ceiling. Truly, where you stand (in this case) depends on where you sit. The Republican congressional leaders some time back argued that the recovery has been retarded by business uncertainty about future government policy. If they really believed that, they would not be engaging in brinksmanship now. But the inconsistencies of the two sides are not the main point. The main point is that the debt ceiling needs to be raised (or better still, abolished) before the crisis point is reached. Senator Obama was wrong. President Obama is right. The Tea Party is wrong. President Reagan was right. President Obama over the weekend backed down on appointing Elizabeth Warren as chair of the new Consumer Finance Protection Bureau. She would have been the most logical person to head the board, which was her idea. She saw the financial crisis coming, and how the crisis was connected to predatory lending practices. Predatory credit card and mortgage companies offered low interest rates to entice people to go into debt, then made up for the low interest income by large hidden penalties and fees. This turned out to be bad for everyone. Warren’s aim was to make financial marketing transparent, so that people know what they’re paying and so that they can compare financial products and make intelligent choices. No reasonable person could object to that, except those who profit from the bad existing system. From her standpoint, it may have been for the best that she didn’t get the job. Republicans in Congress, and the Wall Street faction in the Obama administration would have done their best to thwart her, and I don’t think she would have got support from President Obama. If not for her popularity and the need to appease public opinion, I don’t think he would have proposed her in the first place. I would have expected President Obama to give her token support through the 2012 elections, and then for her to resign in frustration in 2013 or 2014. Now she has a new opportunity—the chance to run for Senator from Massachusetts in 2012. Some Massachusetts Democrats are getting up a nominating petition. She hasn’t said what she will do. I hope she decides to run, and I hope she wins. She would be a voice for reason and justice in the Senate. The trouble with Keynesian economics is that it asks too much of human nature. The late great British economist John Maynard Keynes said it was possible for governments to smooth out the business cycle of boom and bust by doing what Joseph and Pharaoh in the Bible did—to store up surpluses in the good years, and draw them down in the bad years. Human nature is just the opposite. 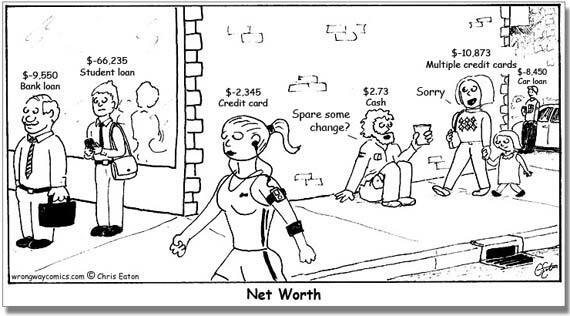 Human nature is to spend money when you have it, and to cut back when you don’t have it. This is pretty much the history of U.S. government policy during the past 10 years. 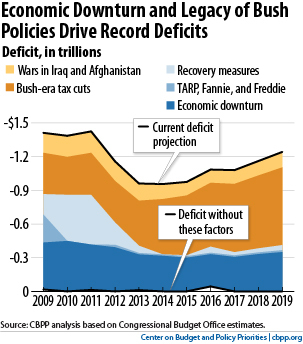 During a period of economic growth, the George W. Bush administration added to the government’s debt by cutting upper-bracket taxes, by starting two major wars and by adding a new mandate to Medicare. Barack Obama took office in the middle of a recession with a government already deeply in debt. Whatever you think of the President’s decisions and priorities (and I think they are mostly wrong), he is in a situation where he has few good options. John Maynard Keynes was not an advocate of big spending or high taxes. He said that, in times of recession, the government should either increase spending or cut taxes—either one would do. President John F. Kennedy, for example, promoted a temporary business investment tax credit in order to counter a business downturn during his administration. But the best way to fight recession, according to Keynes, would be programs or tax cuts that helped low-income and middle-income families because those families would be most likely spend money and stimulate business activity. But whether government increased spending or decreased taxes, the increase or decrease should be temporary, Keynes said. As economic activity picked up, spending and taxes should revert to normal. This is where his ideas are contrary to human nature. As soon as you start a new government program or lower taxes, you create a constituency to keep the program and the tax break through good times as bad. Historically the Federal Reserve System, because it is somewhat (not completely) buffered from political influence, has been able to implement Keynesian economics better than the President and Congress have. The Fed has used its powers to influence interest rates to stimulate borrowing when times are bad, and to throttle down on credit when times are good. As a former chairman once said, the Fed’s job is to take away the punch bowl when the party starts getting good. Unfortunately, under the leadership of Alan Greenspan, the Fed’s policy was just the opposite. During the stock market and housing bubbles, the Fed spiked the punch bowl instead of taking it away. Another way to protect Keynesian policy from human nature is to put policies in place that automatically respond to changes in the economy. One example is unemployment compensation. In good times, workers and employers normally pay more into the compensation fund than they take out; in bad times, the fund pays out more than it takes in. It would be possible to increase the effect by having payroll taxes automatically go up when a state’s unemployment rate goes down, or to increase the period of eligibility for unemployment when the unemployment rate goes up. I think the ideas of Keynes were good as far as they went. I think the United States is in a situation in which a Keynesian stimulus is not enough. The U.S. government is already deeply in debt, and we Americans individually are deeply in debt. We need to rebuild our productive capacity, not just jump-start the economy, and this requires more than temporary measures. That in many ways is a more difficult challenge than faced President Franklin Roosevelt during the Great Depression. Click on The Conscience of a Liberal for Paul Krugman’s web log. Click on RSA Animate for more like this. Washington Post reporters Dana Priest and William M. Arkin wrote a series of articles last year reporting on secret intelligence agencies, whose very existence is a secret and which are growing out of control. It was great journalism. Aside from the implications for basic Constitutional liberties of unaccountable secret surveillance agencies, aside from the implications for democracy of secret agencies accountable to nobody, maintaining this secret world costs a great deal of money. As my friend Jack Belli once said, every advance in scientific knowledge and thought has revealed a universe that is larger and more wondrous than what we previously had thought. Hat tip to Perette Barella. Be satisfied with your opinions, and content with your knowledge. More wonders of time-lapse photography.